Fay Goulbourne thrives on variety and multi-tasking both in and out of the office. A Field Service Administrator for SICK, she’s based in the Stoughton, Mass. office and enjoys the role she plays in supporting engineers, project managers and field service technicians. Fay has worked for the company since late 2015. Her financial- and administrative-related duties include most anything to do with invoicing to customers and payment processing with vendors for field service, known as demand service. These include processing project-related expense reports for company employees and vendors, and making adjustments in paperwork to conform to customer invoicing processes and preferences. “I like the responsibility of the job and the flow of things that we have in this office. It’s a real family environment, which is nice,” Fay says. Her scope of duties exposes her to all areas of the company and its focus segments. While she generates management reporting for many groups, most of her work involves interfacing with SICK employees and outside field techs via phone and email who work to make sure customer installations go smoothly. “As far as the work itself, I enjoy interacting with our different departments such as engineering, tech support, advisors and techs in the field. You really get an understanding of other departments,” Fay says, noting she travels occasionally such as to SICK’s U.S. headquarters in Minneapolis, or to the Houston office as she did recently for SAP migration training. To get it all done, Fay draws on a broad business background. She’s worked as a contract negotiator and as a life insurance agent. Born in Kingston, Jamaica, Fay came to the United States at age 3 and has stayed in the Boston area. Off hours, she pursues her passion for skin care, makeup and color as a trained esthetician. 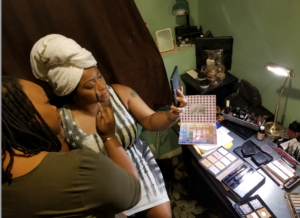 She is approaching a decade of moonlighting as a Mary Kay beauty consultant and teaches their skin-care classes, and also freelances as a makeup artist. 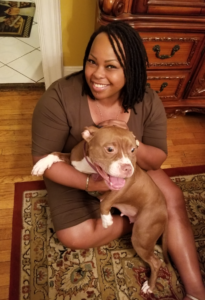 She finds time to be a proud pet mom to her six-year-old pit bull Ally.